Rich Belcher is an event streaming and video production specialist. 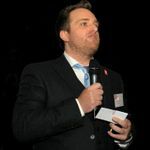 For the past 12 years he has headed-up First Sight Media who work in partnership with organisations across the live events industry - producing all the audio and visual elements of webinars, conferences, awards dinners and much more. He has a real interest in interactivity – having once developed his own interactive sitcom – and has a wealth of experience in streaming events for markets including healthcare to academia and companies large and small. Should I use streaming to expand the reach of my event?